This fall, Laurier Golden Hawk Danton Miller received the news he has been imagining for years. During the 2016 National Lacrosse League (NLL) Draft, the Vancouver Stealth signed the second-year archaeology student to its team. The left-handed forward from Ohsweken, Ontario, set a number of records this season for the Golden Hawks and impressed NLL scouts with his performances playing for the Six Nations Rebels. Miller picked up the sport around the age of eight, but says it is not uncommon for children from Six Nations to have a lacrosse stick in their hands and start throwing a ball from the moment they are able to walk. “Everything revolves around lacrosse — there are a lot of teams and everyone in Six Nations is watching and talking about how games go,” says Miller. Playing the sport he loves in Vancouver and throughout North America will be the opportunity of a lifetime, but Miller’s new coach at the Stealth understands the value that Miller puts on school and doing well in class. With support from his new team, Miller will continue to finish his degree while playing in the NLL. During his final year in high school, Miller was approached by Laurier lacrosse coach Clancy Almas who asked him to consider joining the Laurier team. Miller fits three to four lacrosse times in per week. “I’ve been managing a healthy balance between school and athletics over the past couple of years here at Laurier,” says Miller. Now, he is looking forward to starting the winter season with his new teammates in Vancouver. Miller’s NLL career coincides well with his seasonal work schedule. This past summer, Miller was working on an archaeological dig in Mississauga. As winter approaches, he will be shifting his focus to playing in lacrosse’s top tier. 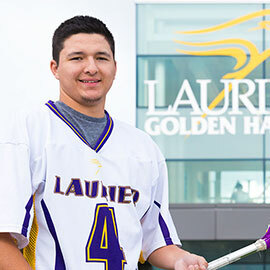 Being involved with Laurier’s Aboriginal Student Centre has helped Miller balance athletics and academics, as well as the transition from high school to university. The centre supports and empowers Laurier’s Aboriginal students, while creating a holistic and Indigenous campus community space. Activities through the centre include art workshops, traditional powwows, drum circles, and information sessions on academic success, career development and financial aid. Miller, who is a member of the Aboriginal Student Association at Laurier, also took part in the SEEDS scholarship incentive program that helps first-year Aboriginal students succeed at Laurier. “As a SEEDS student in first year, I participated in fun events and got to meet great people through the centre,” says Miller. “It’s a positive experience — and like the lacrosse team, it helped me become more comfortable with my surroundings." With his first game scheduled for Jan. 6, Miller is preparing to spend future weekends on the road playing for the Stealth. His weekdays will be at Laurier, where he will continue to attend classes and events at the Aboriginal Student Centre — experiences that have so far helped prime for success in the NLL.